We know that some of the tours you’ve seen targeted at American travelers have prices that are frighteningly high. Our goal is to keep our tours affordable so that you can get a chance to see this enchanting and intoxicating country yourself. We want you not only to learn while on our tours, but to have fun doing it. We want to keep you actively engaged and our entertaining guides are excellent at doing that. In selecting the people-to-people tour activities, we draw on feedback from past Cuban Adventures group tours. We have customers from around the world, not subject to embargo-related restrictions, so they participate in these activities because they fun and interesting- not because they are required! Cuba is not an easy place to operate. Technology, communications, resources, infrastructure and regulatory requirements all present significant challenges in Cuba. 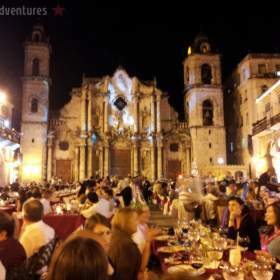 Cuban Adventures specializes in Cuba travel with nearly a decade of experience providing safe and successful Cuba tours. Our groups have a maximum of 12 travelers. Small groups equal greater flexibility and a more intimate experience in Cuba. Traveling in a small group, we have more opportunity to take advantage of spontaneous and unique experiences, like playing a game of dominoes with the locals, sneaking into a theater during a dress rehearsal, or being invited to a friend’s house for a party. We are a small business, with less than 80 employees worldwide, and we love to support small businesses like ourselves! Whenever possible, we use B&Bs (casa particulares) as our accommodations and take our meals in homes or at privately owned restaurants. This helps ensure that we are supporting the people of Cuba, and not the Cuban government. Read more about the accommodations and the food on our tours. Protecting the environment is important to us, as is creating a positive social impact in Cuba. On our tours we avoid any activities or practices that we consider to be harmful to Cuba’s environment or its people. Read our Responsible Tourism Policy.